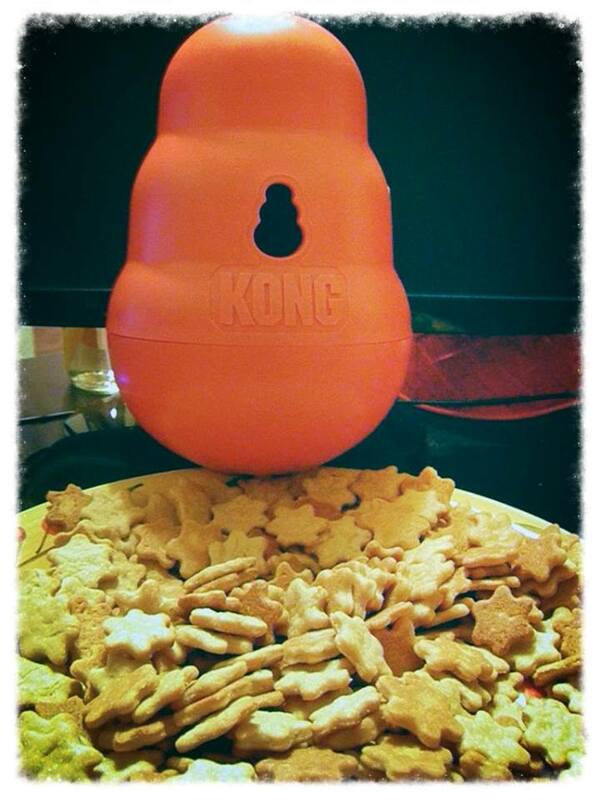 Learn how to make Homemade Dog Treats For Treat Dispensing Dog Toys & Games here. 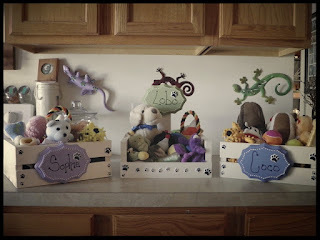 We made 3 toy boxes for under $20! Check it out here and here! Skill level is easy! Just paint, add your personal touches, use a hot glue gun to attach the name plaques, and you're done! You can make pup party hats for Birthdays, Gotcha Days, Adopt-a-versaries, etc. Each hat costs under $1.00 to make. Skill level is easy. Each hat takes about 15 minutes to make. Learn how right here. In 2016, we decided to repurpose a decorative wooden storage chest in a Bodacious Biscuit Love bin. We wanted a place to store pet items that we purchased or were donated to use in our Bodacious Love Care Packages. We make these care packages for pet parents in need. You can read about this DIY Dog Mom Project here, here, and here. I am so proud of this DIY doggy bed. Really, really proud. I had several moments this evening when I looked at it and thought, "We made this! How cool is that?!?!" We stayed within our budget and utilized stuff we already had. You can read the full story on this DIY Dog Mom Project here. I've been making these salt dough ornaments on and off for over 30 years. I love' em. They're super easy to make. You can keep it simple and use cookie cutters or go all out elaborate and create freehand ornaments. Salt dough ornaments make great gifts and it's something the kids can do pretty much on their own. And, if you store them properly, they last for years and years and year. 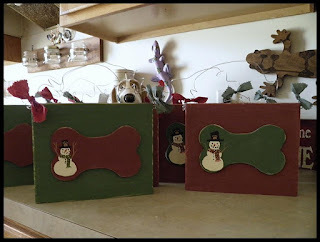 Here is the tutorial to make these adorable dog bone shaped ornaments. Small pieces of wood, the size of a bar of soap, are the perfect size to make DIY Dog Mom Project holiday ornaments. Just paint, add your own design, personalize, and coat with a satin varnish. Then, put an eye hook at the top and finish with twine so you can hang the ornaments. For more details, go here. If you don't want to bother with cutting wood or don't have access to tools, no problem. Michael's, and other craft retailers, usually have a large selection of pre-cut wood items. After a little sanding, some paint, and your creativity, you can create some incredible DIY Dog Mom Projects for your home or to give as gifts. Details on this project can be found here. For Lobo's 2 Year Gotcha Day gift, we repurposed our old entertainment center. It's our biggest DIY Dog Mom Project to date. Thankfully, the weather worked in our favor and all of the priming and painting could be done outside. We've got all the details for this DIY Dog Mom Project here. Crate cushions can be expensive. A lot of styles are not washable. And, most are filled with stuffing. If your kid likes to rip apart anything with stuffing, the store bought crate cushions won't last long. This is the problem we ran into with Willa. One afternoon, I took a couple of hours and made 3 thick and soft crate cushions that wash incredibly well. The total cost for this DIY Dog Mom Project was around $7. The tutorial is right here. What happens when you have a bunch of upholstery fabric that you have no use for? You make bone shaped dog pillows. You can read about this DIY Dog Mom Project here. In our Dog Mom household, scrap wood never goes to waste. I use scrap pieces to make gorgeous DIY Dog Mom Projects including dog themed decor, leash holders, doggy toy boxes, and more! Most of the time, our table is covered with DIY Dog Mom Projects in progress, paint, brushes, sandpaper, and paint cups. One of our favorite things to do during the warm weather months is hit up local yard sales for wood items to repurpose into dog themed items. At a recent yard sale, we stumbled on this adorable wooden bench and scooped it up. We had a lot of fun working on this bench. It was hard parting with it when it sold. You can read more about this DIY Dog Mom Project here. While straightening out the biscuit/craft room and taking inventory of our wood pieces, I discovered some smaller square and rectangle shapes. I also found a couple of medium length dowels. The first thing that came to mind was pumpkins. Wooden pumpkins. Doggy themed wooden pumpkins. What happened next? Find out here. A neighbor friend of ours, who knows we make a considerable amount of DIY Dog Mom Projects, is always giving us boxes of wood. Not too long ago, he gave us 2 pieces of old barn wood. It was the right size and there was enough wood to make a DIY Dog Bed. That's what we did. And, we kept it for our kids. Read more about this project here. Last year, we made salt dough bone shaped ornaments for the holidays. This year, now that Lisa has her woodshop all set up downstairs, we made personalized wooden holiday ornaments to sell. We also offered "Happy Paw-liday ornaments. And, for our holiday party, we made Love ornaments to hand out as gifts. Each ornament had a small eye hook at the top and twine to hang the ornament. We made a total of over 70 ornaments. There's more about that here. My big DIY Dog Mom Project for this week was making these wooden doggy bone Welcome Signs. I had 10 pieces of wood left that Lisa had cut and sanded a couple of weeks ago. I also had 9 wood doggy bones that were hand cut by the talented Mr. Ice. After painting the wood Lisa sanded, I picked out coordinating colors and went from there. Go here for the details. I am head over heels for these Bodacious Personalized Holiday Signs. 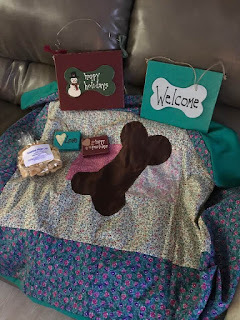 It was one of our DIY Dog Mom Project for the holiday season. I knew it was a little too early to post them, but I couldn't resist. Not only was I excited to use the hand-cut wooden doggy bones our friend Mr. Ice made us, this is the first holiday season where our DIY Dog Mom Projects are in full swing. One of the many things I love about Lisa having a woodshop downstairs is the abundance of wooden DIY Dog Mom Projects that we can make. That would include the personalized Christmas ornaments we're able to make and offer up for grabs. We've been wanting to make DIY Dog Gates for the upstairs and downstairs front porches for a long time. Towards the end of the Summer, we got our hands on some scrap picket fencing. There was plenty to make the gates! After a trip to Lowes for additional wood and paint, Lisa built the DIY Dog Gates. For a decorative touch, she cut 2 wooden dog bones. Once done, she brought them upstairs for me to work my magic with paint and lettering. You can read more about these gates here. We sell a lot of our DIY Dog Mom Projects, but we also put some aside for gifts. Over the holiday season, we sent out a few Holiday Love and Cheer Packages. These packages included some DIY dog themed signs, patchwork doggy quilts, and our Bodacious Biscuit Love peanut butter dog treats. The recipients loved 'em! Just recently, we celebrated Lobo's 3 Year Gotcha Day. When our kids celebrate their Gotcha Days, they get to pick out a special dinner, dessert, and gift. Lobo wanted a DIY Indoor Dog House to share with Coco, Sophie, and Willa. To date, this was our biggest DIY Dog Mom Project. Lisa built the dog house in her woodshop. After Lisa was done building it and cutting out a few decorative wooden pieces, she brought it upstairs. I spent 2 days painting, creating the decor, and making a bed, dog pillows, and a patchwork dog quilt. You can read more about this project here and here. Remember the DIY Dog Gates for the front porches? The weather finally cooperated and we were able to install them. LOVE! Over a week ago, a rather large box was delivered to our doorstep via UPS. Inside of the box was a jumbo, custom-made wooden dog bone. I had plans for this gorgeous piece. Last weekend, I started the process. Throughout the week, I was busy tackling work projects. I only had a bit of time here and there to work on the jumbo bone DIY Dog Mom Project. Today, we finally finished it. Check out the step by step process for this project here. A couple of years ago, some clients of mine gave me a handcrafted wooden outdoor planter. The entire piece was painted white with a barn red 'Welcome' on the front. At the top, in the middle, an antique horseshow was adhered. We've utilized this outdoor planter for the past 2 Summers. Unfortunately, towards the end of last Summer, the antique horseshoe rusted and fell off. The handpainted 'Welcome' faded. So, last week, I gave it a makeover and transformed it into a dog themed piece. More DIY Dog Mom Projects are in the works! I'll be offering some of these items up for grabs. The rest will be put aside for our vendor table at the Ledyard Animal Control Appreciation Day.